Let me explain with an example using the corresponding visuals below. 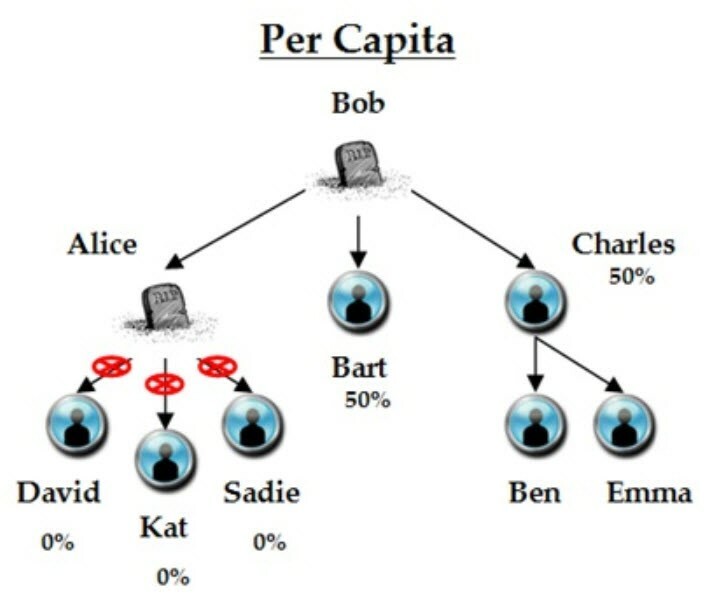 Bob is a widower and has three children: Alice, Bart, and Charles. Each child is an equal beneficiary of his IRA. Therefore, at his death he expects that each child will receive 33.3% of the value. Two of Bob's children have children. However, what happens if one of Bob's children (Alice) predeceases him? What happens to Alice's 33.3% share of the IRA? That will depend on if Bob elected a per stirpes or a per capita election when he completed his current beneficiary designation forms. 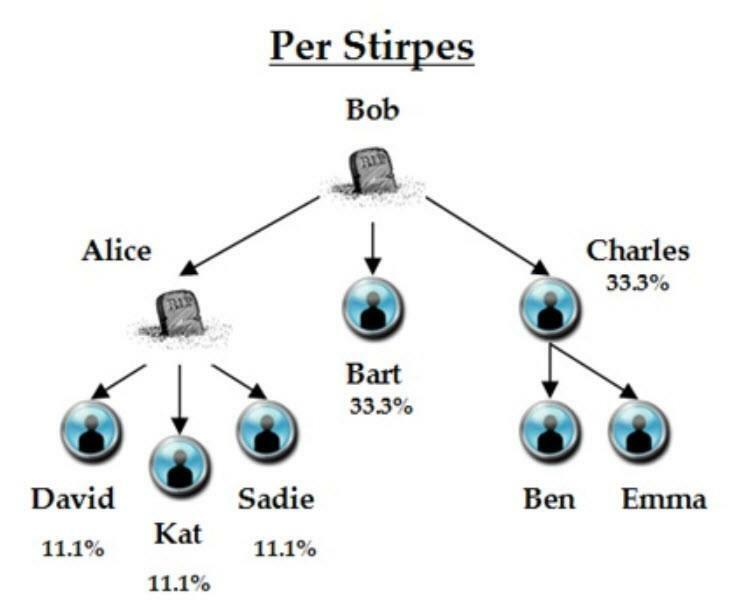 As shown in the visual below, at Bob's death (again, assuming Alice predeceases him) a per stirpes distribution election passes Alice's share of her inheritance down to the next generation (i.e., to the children of Bob's deceased child). Therefore, in our example, notice that Alice's 33.3% share goes to her children equally (11.1% each). Bart and Charles each receive their expected 33.3% share. Most clients elect a per stirpes distribution method in the event a child predeceases them. However, let's now take a look at the other method: per capita. Under a per capita distribution method, the deceased child's share does NOT go to the deceased child's children, but instead goes to the other co-beneficiaries. Have you made a conscious election for either per stirpes or per capita? If not, this would be a good time to review, verify, and update the beneficiary elections on all of your investment and insurance accounts with all financial institutions. This would include any regular (non-retirement) accounts that you have set up with P.O.D. (payable on death) status which also acts like a beneficiary designation. As our clients know, we review TD Ameritrade beneficiary elections at the time their accounts are set up, and at regular intervals thereafter to ensure their elections match their wishes. We also strongly suggest you discuss this issue with your estate attorney to ensure you understand all of the nuances so you can make an election that satisfies your wishes.